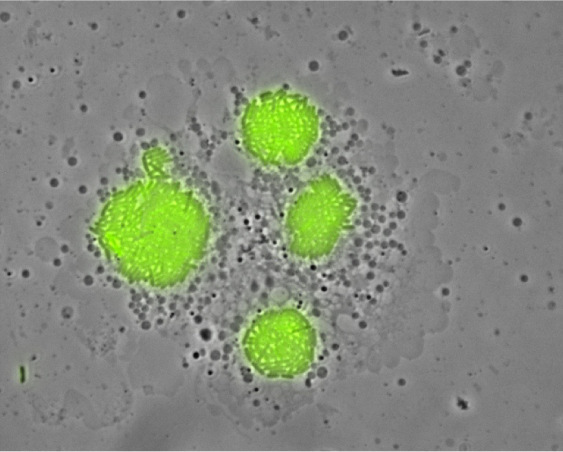 The bacteria Legionella (green) grow inside ‘bubbles’ within larger cells. This image shows four Legionella containing vacuoles (LCVs) inside a recently killed larger cell of a free-living organism called an amoeba. Image courtesy of Howard Shuman. New research from the University of Chicago, published in Proceedings of the National Academy of Sciences, describes how the bacteria that cause Legionnaires’ disease hijacks the host cell machinery to cause infection. Work from Howard Shuman, PhD, professor in the Department of Microbiology, and colleagues, discovered a set of proteins in the bacterium Legionella pneumophila mimic host proteins to take over a key cellular process that allows the bacteria to expand within the cell. Legionella causes an infection called Legionnaires’ disease, an atypical pneumonia characterized by cough, fever, and muscle pain. This illness is very common in both community and health care settings. Smokers, immune-comprised, and older individuals are particularly susceptible. In the United States there are tens of thousands of reported cases per year. Legionella grows in freshwater environments, and according to the Centers for Disease Control, it can spread in human-made water systems including air conditioning cooling towers, hot tubs, and large plumbing systems (it’s named after the 1976 American Legion convention in Philadelphia, after an outbreak where it was first identified). People can acquire Legionnaires’ disease by breathing in aerosols from contaminated systems. Contamination in large cooling towers can lead to disease outbreaks like the one seen last summer in New York City. The outbreak sickened 128 people and caused 12 deaths, and motivated both the city and state governments to pass legislation to regulate cooling towers. While there are currently no federal regulations controlling air condition cooling towers, there are non-governmental organizations like the American Society of Heating, Refrigerating and Air-Conditioning Engineers (ASHRAE) and the NSF International that publish standards and guidelines, the most recent in 2016. According to Shuman, if these standards and guidelines were followed, the incidence of Legionella infection would not be nearly as high. Once in the body, Legionella invades immune cells, allowing it to avoid detection from the immune system and multiply. The bacteria create a space inside the immune cell called the Legionella containing vacuole (LCV), a fluid-filled ‘bubble’ that is separated from the rest of the cell by a membrane. Until recently, it was unclear how this membrane-covered bubble continues to expand inside the host cell, allowing for growth of the bacteria. In humans the process of fusing membranes within the cell is controlled by a set of proteins called SNAREs. Shuman and colleagues identified a group of Legionella proteins that mimic the host SNARE proteins, which allows the LCV to expand. These proteins take other membrane covered cellular compartments and fuse them to the LCV, creating a larger and larger bubble for the bacteria to grow. These Legionella proteins work in concert with a human protein called VAMP4. In human cells this protein helps to mediate the fusion of membranes. When VAMP4 is absent, the LCV cannot expand, and infection does not occur. The Legionella proteins mimic the host proteins and essentially kidnap VAMP4. This hijacking event is irreversible and enables Legionella to control membrane fusion events that are required for expansion of the LCV. “The reason that membrane fusion events are important for Legionella is because the bacteria are clearly controlling which ones can happen and which ones are not going to happen,” said Shuman. According to Shuman, this is a novel example of the emerging arsenal used by intracellular bacteria for manipulating host cells to cause infection. This work was done in collaboration with Reinhard Jahn, PhD, Director of the Max Planck Institute for Biophysical Chemistry in Germany.